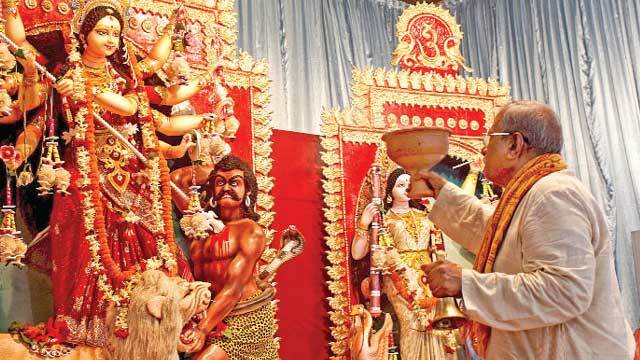 Dhaka, Oct 19 (Just News): The five-day Durga Puja, the greatest of all Hindu festivals, will come to an end today (Friday) with solemn immersion of the Goddess Durga in the capital and elsewhere in the country. Devotees are thronging Puja mandaps to celebrate BijoyaDashami, the last day of the festival and reciting the mantras and offering flowers to the goddess Durga (pushpanjali) and praying for her blessings. BijoyaDashami is the special ceremony of reaffirming peace and good relations among people. In the capital, thousands of people are set to throng the Buriganga today to observe the final phase of the festival -- the immersion of the goddess Durga. Devotees in their tearful eyes will bid farewell to the mother deity and her children - Lakshmi, Saraswati, Kartik and Ganesh - through the immersion of their idols in the water wishing Durga's return next year. The five-day festival started on October 15 with the incarnation (Bodhon) of the Goddess Durga marking Sashthi. Durga Puja, the annual Hindu festival also known as Sharadiya (autumnal) DurgaUtsab, is the worship of "Shakti" [divine force] embodied in goddess Durga.